With our graphic card driver for Intel onboard cards also the resolutions 800x480 (and 1366x768 with some systems) become available. But you need to check that the resolution is also supported by your display. If your already purchased display has no support built-in we in most cases can upgrade it for a charge of 20 EUR + shipping. Please contact us for this by email and let us know your invoice number and serial number of your device. Note : 1366x768 not available on all displays. 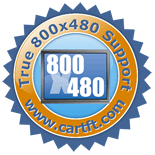 If you have problems or questions, then please contact our support team (support@cartft.com). If you know better or alternative display timings (also for other TFT models), then please inform us so we can integrate them in the driver aswell.